For our wedding, my family got together and made us a recipe book. Spearheaded primarily by one of the most excellent additions-to-the-family our family has ever been lucky enough to know, my sister-in-law Pam, it’s packed full with recipes from both my mom and my dad’s side of the family. I opened it as we drove back from our wedding weekend. I laughed; I cried; it was GENUINELY better than Cats. Many of the recipes are indeed longtime family staples, like my mom’s beef cream cheese ball or my grandma’s unbelievably tasty Christmas fruitcake. (Seriously — nobody ever believes us that it’s as good as it is. Fruitcake doesn’t make friends easily.) Others are just freaking delicious recipes I’m excited to try. Anyway. It’s one of my very favorite gifts I’ve ever received. Thank you again to my family for being exactly who they are, and for taking the time to put together such a perfect and thoughtful gift for us. 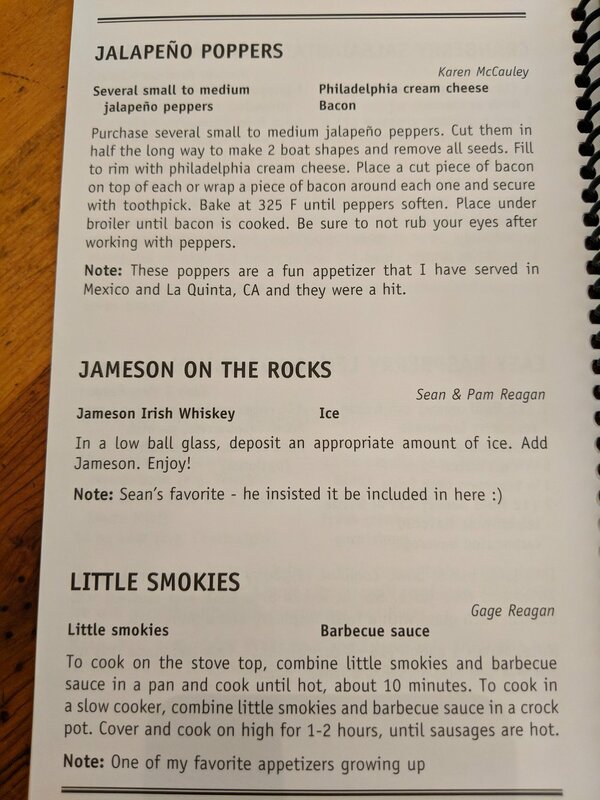 And without further ado, for your nice thing on this otherwise fraught Friday morning, have some heartfelt recipes from my family. 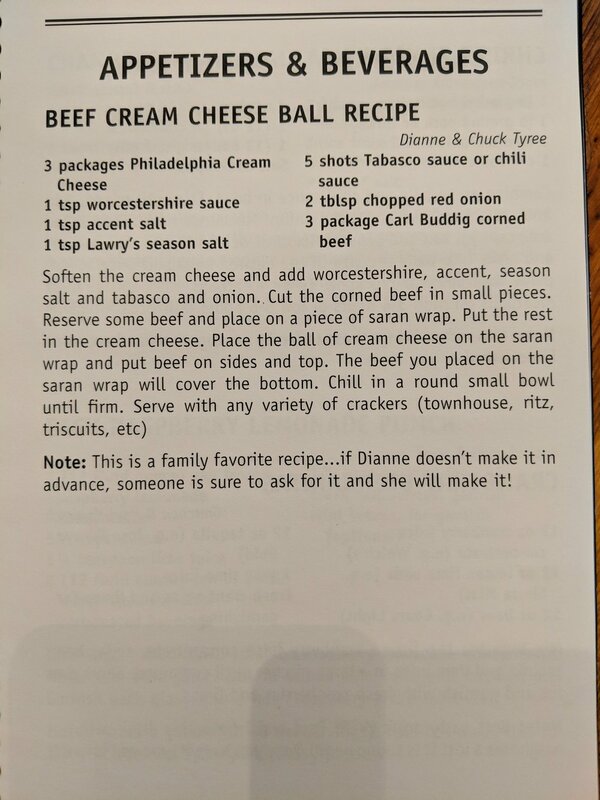 The famous beef cream cheese ball, best-served with Ritz crackers, along with the equally famous Pissy Chrissy bars, named after my cousin Chris following an uncharacteristic snit caused by an unfortunate baking mistake. Also my stepmom Anita’s amazingly delicious peanut butter bars which I reliably eat far too many of each and every time I visit. In this next section, two things you wouldn’t necessarily think you’d like: fruitcake and rhubarb. Please note the uniquely passive-aggressive tone of my grandma Helen’s note, may she rest in passive-aggressive peace. The rhubarb recipe indeed came from my first daycare lady. She used to sing songs like “Bibbidi-Bobbidi-Boo” to us as she made our lunches. She was magical, and her rhubarb wasn’t bad, either. Next, two recipes from two of the Reagan side’s natural-born chefs. (Notably, I do not count among those ranks.) My dad Jim’s marinade is also fantastic on pork, or at least so he tells me as of last week. 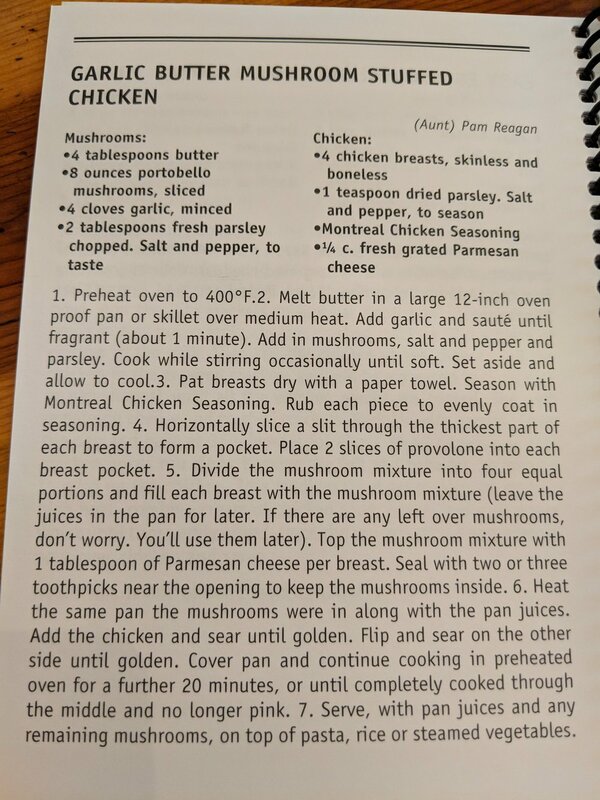 My aunt Pam’s garlic butter mushroom stuffed chicken is sure to be a crowdpleaser. My cousin Jeanelle’s husband Ben is one of our family’s most accomplished chefs. His attention to detail is as impeccable as it infamous, so I imagine this jerk marinade is going to be top-notch. (Just ask the ex-boyfriend-o’-mine who totally missed his plane when Ben’s delicious dinner took maybe an hour and a half longer that anticipated to prep.) My niece Maddie and her dad contribute two tasty appetizer recipes. Yes, we really do stand around and fill up on appetizers before most communal family meals. Finally, for your recipe-book dessert, some desserts. Aunt Maureen’s secret ingredient really will make the softest and loveliest chocolate chip cookies you’ll ever have the privilege to make. 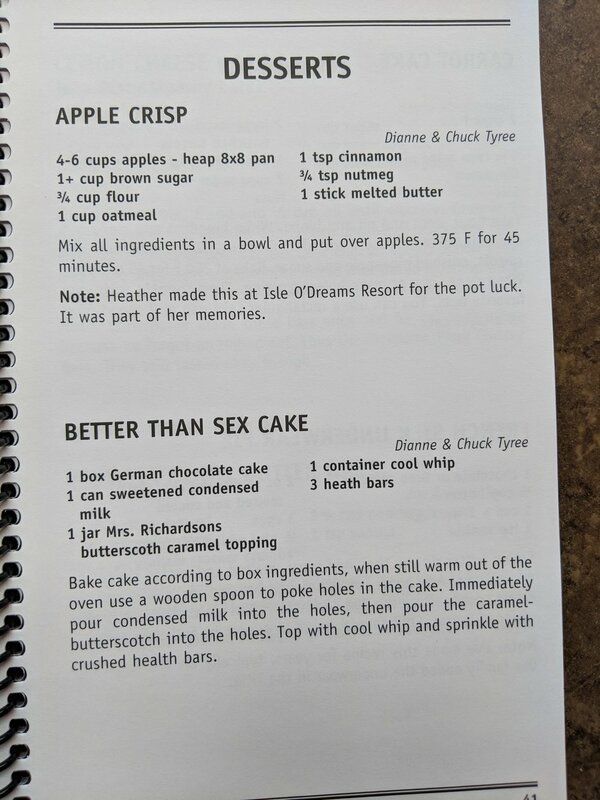 I used to make this easy apple crisp all the time on the summer trips we’d take to the then-idyllic Isle O’ Dreams resort. And yes, my family really does love cake, as clearly evidenced by the title of this one. I’m sorely tempted to keep going, as there are still so many recipes I could add — like my aunt Linda’s rice pudding (served every holiday), my dad’s stuffed portabellas, Ben and Jeanelle’s fluffy pancakes, and my mom’s corn and bean salad. Suffice to say, we’re a well-fed family that loves feeding each other. That will never stop, and I’m glad for it.